They say a picture is worth a thousand words, but I’d need a thousand just to describe the carefully disheveled cap placement. I’d need another grand just to describe the positioning of the cranks or front skewer or downtube shifters. I’d be another mille mot in the hole to discuss the fit of the jersey or the white socks and black shoes. All those words and still I wouldn’t have touched the way he’s holding his bike with his forearm. This is the Casually Deliberate masterclass. Full stop. Here Zoetemelk conducts an in-depth study on losing the race before it starts. 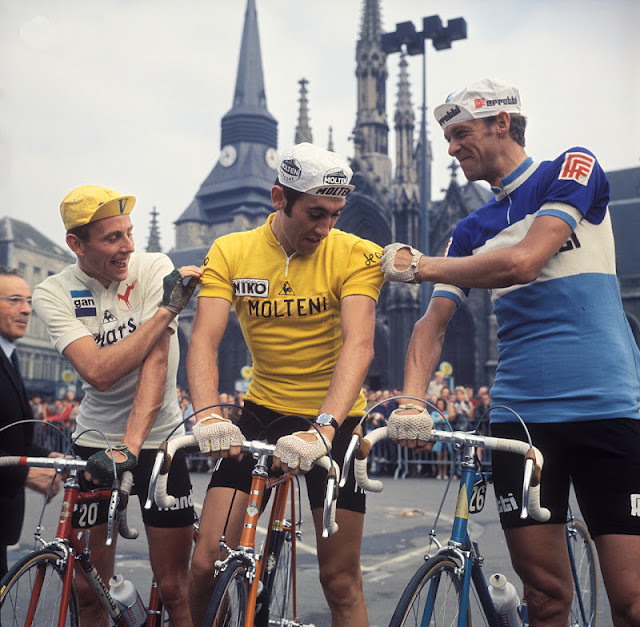 Joop in loafers and with disheveled hair, Merckx basically looking like Elvis Presley in Cycling Kit. And, in case its not clear, Elvis was a closer. Frank – maybe you should burn those adidas sandals and get some Joop Loafers to wear before & after rides…You might be less of a hard time ’round here! Or, possibly more. sideburns and of course: SPONGE! Gents, today is a day off the bike for me. after the Remembrance Day ceremony at the town cenotaph, the family had lunch and a few beers at the Legion (VFW for Americans) with a couple of the old boys. Shaun, a fellow A’stan vet and Gary, a former Commando thatlast served in Croatia – still has the shrapnel in his body from it; and families. I raise my bottle today for Remembrance Day/Veterans’ Day. I hate to tug on Superman’s cape but a wrist watch? I would have thought with the competition receding in his wake that time would be of little importance. Here’s a pic from Cyclingnews coverage of Strade Bianchi of Faboo with his analog watch. I guess it’s the timekeeping equivalent of the V-Meter. This looks like a frame taken straight out of The Triplets of Belleville. @VeloVita Such an awesomely bizarre movie. Really need to watch it with the VMH but the frog scenes just make me feel a bit sick. I always wear a watch! I get a real kick out of it when someone says, “Oh god, what time is it? I can’t find my phone.” Someone created this magical thing…it’s called a wristwatch! The only reason I’d considering swapping out my $12 Casio is because The Prophet wears a leather-banded analog one. I do have my letter winner watch from college, got a leather band and all, kind of like the nerd’s equivalent of a letterman jacket. I agree 100% – I’m terribly ranidaphobic, but I deal with it because I love the film. Amen! I love a real watch. Can’t exactly say how many I have though . . . When people cry out “what time is it?” By the time someone has fished out their smartphone from a pocket or purse, I’ve already told them what time it is.